Music history regards 1982 as the year American rock band Toto achieved its greatest success. Mainstream radio saturated airwaves with Top 100 Toto hits – Roseanna, Hold the Line and Africa. You didn’t have to like Toto, I changed the station when they aired but still knew every word by heart. Toto hits were a fact of life, songs destined to occupy supermarkets and customer service hold lines 30 years later. Fast forward to the continent of Africa, Namibia to be precise. Namibian artist Max Siedentopf recently created an ode to Africa in his nation’s desert. 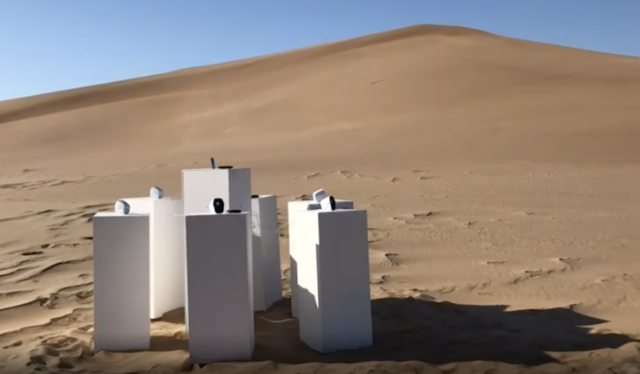 Seven stark white pedestals, each with a solar powered mp3 player constantly looping Toto’s Africa. Siedentopf freely admits that despite using the most durable materials available, his dream of Africa looping for all eternity could be stymied by harsh desert conditions.